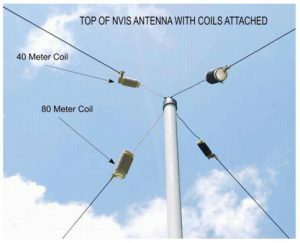 I have been researching NVIS antennas and have encountered a few interesting military versions. 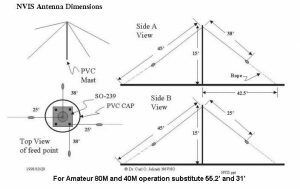 The AS-2259 is one example which uses a 3m mast and set of two offset fed dipoles (7.56 m and 11.22 m) The dipoles are laid out in a square formation – with the ground of the feed driving one set of wires (7.56 and 11.22) and the center driving the other set. Ends of the wires have insulators and lengths of rope to allow mounting. The arrangement requires a tuner and looks like it is useful for 2 – 20 Mhz. Keeping in mind that with NVIS the critical frequency rarely extends above 10 Mhz and if often below 6 Mhz. Looks like an interesting portable antenna that is self supporting and able to be deployed quickly without fuss. I think I will be making one next weekend using PVC pipe sections. I especially like the information from W9WIS on adding coils to achieve 80m and 40m resonance. 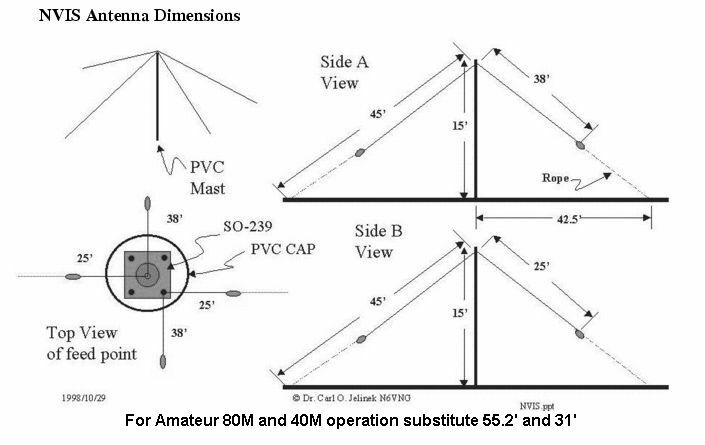 (Amateur radio operators are limited on the bands we can transmit 🙂 ) The big thing about this article is that given Amateur use on 80m and 40m, a set of coils can be added to each arm to electrically lengthen each arm of the antenna to improve resonance on Amateur bands. The 80M coils use 1.5 inch pipe (which has an outside diameter of 1 7/8 inches) and 19.5 turns of 14 gauge insulated wire. The 40M coils use 3/4 inch pipe (which has an OD of 1.05 inches) and 14 turns. Both coils are spaced 7 inches from the top of the mast using a short length of 14 gauge wire.